We couldn’t have asked for a better start to the year than seeing 284 brave souls swim at our 4th annual New Year’s Day dip. The weather was bleak, the water a skin tingling 10°C. However, their minds were set and this was not going to deter any of the daring swimmers from jumping into their new year with a splash. The vast majority faced the cold water in nothing but their swim wear, they jumped in at the deep end, did a few quick lengths and then retreated to a well deserved hot shower. Swimmers then gathered on the veranda to enjoy a selection of hot refreshments and watch other participant’s reactions as they experienced the plunge! It’s safe to say there were many laughs and chants coming from the veranda as swimmers of all ages were encouraged to dive in. The popularity of this event has increased year on year. At our first New Year’s Day swim in 2014 we saw just over 100 people, now at our 4th annual event we have almost tripled that number welcoming a phenomenal 284 swimmers at our unique outdoor pool in the Peak District. 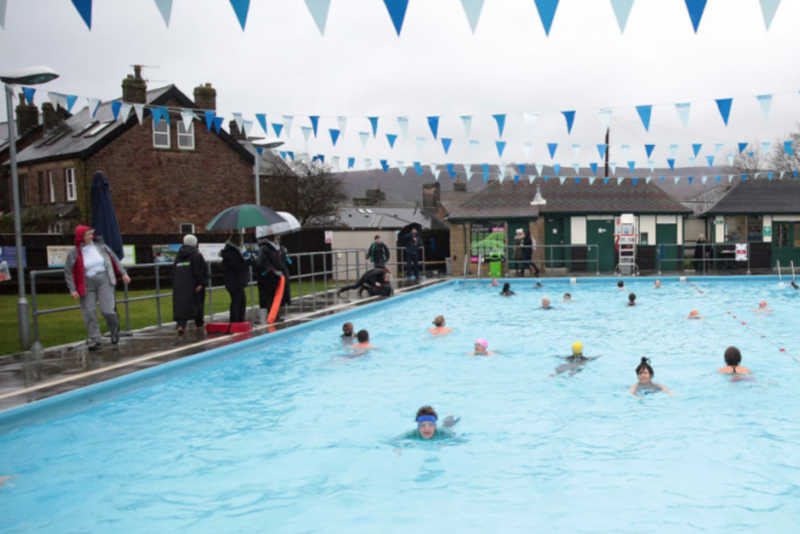 From all the staff at Hathersage Swimming Pool, we would like to say a big thank you to everyone that swam, served refreshments and made soups/cakes for the event. You all helped make the event enjoyable and a huge success.